As I often go with storm chasing tours I am often left with trying to determine the skill of a certain tour guide. That goes as well when I read reviews visitors write on this website. 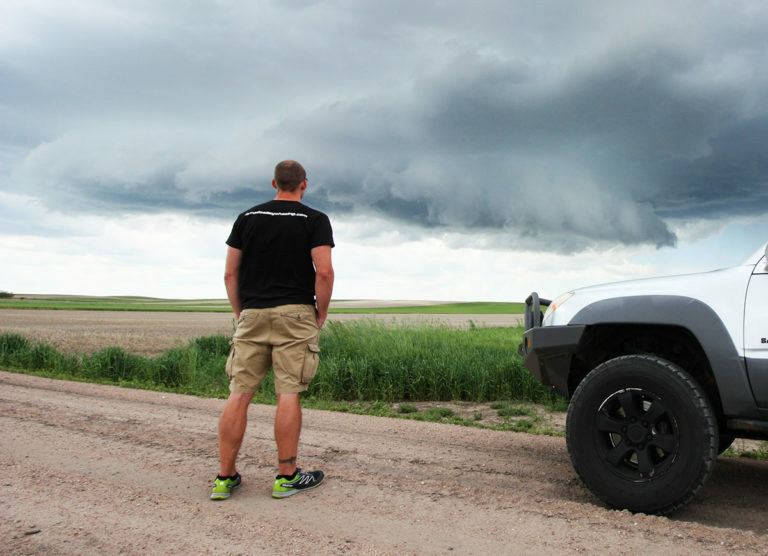 How do you know if a certain storm chaser, like your future tour guide, is skilled or not? I assume we first need to determine what actually means “skill” in terms of a storm chaser. In this blog post, I will mainly talk about tornadoes as this is usually the primary target for most storm chasers and also the most difficult target. Tornadoes are not a great measurement as many chase storm structure or lightning primarily. Even tornado-aficionados would likely prefer an amazing storm structure over a semi-condensed, low contrast HP, bird fart tornado. Another aspect I am not taking into consideration is safety, the more aggressive chaser you are the more and better tornadoes you see but is that really a sign of skill? You cannot demand any storm chaser, even if you would chase with Tim Marshall, that they would find the best storm and/or the best tornado of the day every day and to constantly be in the perfect position to see it. No matter how good your storm chase was, you will 98% of the time find better storms, tornadoes or at least better angles or closer view of the tornado(es) on social media than you saw yourself. If you are on a tour, should you blame your tour guide for not providing you the best possible experience every day? Of course, no. As a tour guest on a storm chasing tour, even if you are quite experienced tour guest as I am, it is very difficult to determine whether a tour guide is good or great. If you miss out on a tornado, end up in the wrong position, the wrong road or too late – does that mean the tour guide is bad? Did he even make a bad decision or was the decision at that time and point the best, but it just turned out to be bad? 99% of all storm chasers and every tour company missed out on the 1-hour Laramie, WY, tornado and that doesn’t mean they necessarily made a bad decision. As far as I understand, the tornado appeared in a 40 degree dewpoint area with no extreme parameters in CAPE or shear. Choosing a target area like that would have been an unwise decision for most other cases. Basically, in order to actually understand whether a tour guide is good or great you have to be at least just as good to see when he makes good or bad calls. Going south or continue east? Wait another 5 minutes or leave? In most cases I wouldn’t be able to determine better than any tour guide I have been chasing with – and neither would 99% of the tour guests so tour guests are not very good judges of the skill of a tour guide. Often the amount of storms and tornadoes seen on a specific tour is used as a quality marker in reviews, which often is a bad quantifier. Who didn’t see at least 10 tornadoes in the week of Leoti, Spearman and Dodge City 2016, for example? There are three, or maybe more, types of quality markers that are typically used, either by the storm chaser himself or by others: Number of years chased, a meteorology degree, and tornado count. Other quality markers, valid or not, would be footage and fame. None of them are really great quality markers though. Number of years chased: I would believe this is the most credible and probably most useful quality marker. Storm chasing has a lot to do with experience – mainly because storms are quite unpredictable and the more data you personally have, the more you have seen, and the more chase days you have (whether they were successful or not) the more you learn and can apply for future chases. Those who started chasing in the 90’s are usually more skilled than those who started last year. There are a number of flaws with this measurement. Usually, chasers state the years they started which doesn’t mean they have chased every year since. For example, I had my first chase in 2009 but didn’t chase again until 2012. Instead, “Number of chase days” would likely be a better quantification. If you chase one week per season compared to another chaser who chase 1.5 months every year – it makes a big difference. Another flaw of “Number of years chased” is that some could chase every year without really learning much by not evaluating the chase days. If you don’t learn from your mistakes, does experience even matter then? Meteorology degree: I have a hard time determine how much you would benefit from a meteorology degree when you chase storms. Having one is of course better than not having one but does it necessarily make you a much better storm chaser, all other things equal? I honestly don’t know. With a lot more theoretical knowledge I can only assume you have more theoretical experience of doing great forecasts. So, I would think it is safe to assume that a meteorology degree makes you better at forecasting and, as such, a better storm chaser than without the degree. It is just a matter if it can be translated into being better at catching storms in the end. I, for one, have seen some 30+ tornadoes but all of them as a tour guest or while chasing with a more experienced storm chaser – which says nothing about my skill. This may be a rare case but if you, for example, chase with a better chaser you may have a good tornado count without being a good storm chaser. The longer you chase, the more tornadoes you see. If you have been chasing since the 90’s you probably have seen a few hundred tornadoes. You have gained lots of experience from doing so but seeing lots of tornadoes is also a sign of having chased a lot. If Tim Marshall would be out chasing 5 days this season and I would be out 50, I guess I would still stand a better chance at seeing more tornadoes than him – just from having more opportunities. Tornado days would probably be a more valid quantification. It takes much more skill to see tornadoes on five different days than to see 5 tornadoes on one day. Especially, since a tornado outbreak is usually easier to forecast than a fluke tornado on a marginal day. Counting tornadoes is usually a very subjective experience. In a way, the more inexperienced you are the more “tornadoes” you see. I talked with Roger Hill about this as he holds the Guiness World Record in tornadoes seen. For a tornado count to be valid you need to have footage and a witness of each tornado! I doubt no one counts their tornadoes with those rules. Combing the number of tornado days you have had over how many days you have chased would likely be a better quantification. Like, a success ratio. There are of course flaws with that as well (picking 50 chase days in the lousy 2018 season compared to 10 in 2011 would yield an unfair comparison). Having said that, I still believe tornado count to be one of the best quality markers that are currently available. Even if a large number of tornadoes means you have also chased a whole lot of days and maybe even have a bad success ratio, you would still have a lot of experience from the bad days as well. Footage: Is footage a good quality marker if a storm chaser is good or not? I would say Yes and No. If you, as a single storm chaser, constantly manage to get great footage of tornadoes you are more likely to be better than one who does not. Still, this quality marker is subjected to a lot of flaws as well where the most obvious is that you get better footage the better photographer you are and the better equipment you have. If you have an excellent telescope lens, you can gain a couple of miles of flawed positioning and still get that close-up footage. Footage, I would say, is more of an external validation of a certain storm chaser. With that I mean that people tend to perceive a certain storm chaser as a good storm chaser if you see a lot of great footage from him or her. Footage is often also used by storm chasing tour companies to show how well they have performed in the past. For good reasons, that is what tour guests want to see and it does show how well they have performed previously. For the above reasons, and the fact that there have been cases of stolen photos, it should not be used as a very important tool to compare storm chasing tour companies though. Fame and reach: Some storm chasers are perceived, at least by the public, as being very skilled just by the fact that they are seen everywhere, have thousands of followers on social media, and perhaps even their own TV show. How a skill is determined by the public is of course not a good quality marker of a certain storm chaser but there is no linear correlation between fame and skill. However, if you have a huge following on social media and your own TV show, one of the reasons of you having that is likely that one major attribute is you being a good storm chaser. In addition, being famous also puts you into scrutiny by all others. If you are not good at what you do, it would quickly come out. So, what is my conclusion with all this? Unfortunately I have no suggestion how to determine the skill of any given storm chaser or tour guide based on data like the one above. Storm chasing is a game of probability and the better you are, the better you perform over the years in terms of relative success. On any given number of chase days, you squeeze out more good chase days than others. The only way of really determining the best storm chaser in the world today would be to arrange a 100 day-challenge for example. Let’s say all competing storm chasers would chase on the same days, starting on the same location, all equipped only with a phone camera. The one who gets the most tornado days (x points), the most tornado days (y points) and the best views/photos (z points) of those particular tornadoes is likely to be the best storm chaser – or tornado chaser at least. Photo: David Williams watching a storm. David is a very skilled storm chaser in my opinion: very smart, analytical and makes a strong effort of learning from mistakes and bad days and thus constantly improves. Good qualities of a storm chaser, but hard to quantify.